The lowdown: Almost everyone—even those who don’t drink—can name at least one bourbon brand. The spirit appears in songs and movies, is the official beverage of the world’s most famous horse race, and haunts the hangover memories of every former college student. But what separates this American spirit from other cheap shots and fine drams? First, bourbon is a type of whiskey, the name given to any spirit distilled from grain. The earliest whiskeys were made around the 15th century in Ireland and Scotland, and would have been unaged, rough spirits made from malted barley and flavored with spices. Called aqua vitae (in Latin) or uisge beatha (in Scottish Gaelic), this “water of life” caught on with Northern Europeans—first medicinally, then recreationally. By the time colonists revolted in America, these spirits (now anglicized to “whiskey”) were mainstays in the new country, both in imported and indigenous forms. New England rye made a fine variety, but pushing westward over the Appalachian Mountains, frontiersmen turned to distilling the uniquely American grain of corn. Whisky produced in the U.S. at not exceeding 80 percent alcohol by volume (160 proof) from a fermented mash of not less than 51 percent corn and stored at not more than 62.5 percent alcohol by volume (125 proof) in charred new oak containers. This definition preserves the history—corn-forward and kissed by charred wood—but it’s interesting also for what it does not require. Contrary to what many barflies argue, bourbon needn’t be made in Kentucky, stored in American oak (or barrels at all), or aged for any minimum amount of time. Today craft distilleries around the country make creative versions and put subtle twists on the category. Kentucky, however, still represents the vast majority of bourbon production. With nearly 6 million barrels aging in the state right now (more than one for each resident), small distillers are fighting an uphill battle to dethrone the Kentucky classics. The taste: Let’s get the obvious out of the way up front. Bourbon (and most whiskey, for that matter) is high in alcohol and will overwhelm your senses on the first smell and sip. Take a strong whiff off a fresh pour, and your nose hairs will sizzle and fall out. That reputation means that the squeamish prefer shots to get it over with, but bourbon has the potential to reward a more careful palate. In young bourbon, the most prominent flavors come from the grains. Corn yields a backbone of sweetness—think roasted corn on the cob or hearty cornbread—with touches of fruity and floral flavors from the yeast used for fermenting. If wheat is used in the grain mix, the bourbon will be creamy and smooth like warm oatmeal or fresh-baked bread. If spiked instead with rye, the spirit becomes spicy with notes of cinnamon, black pepper, or nutmeg. The spirit also picks up flavors from the wood it’s stored in. (It picks up 100 percent of its color from it, too; bourbon is clear as water when it comes off the still.) Barrel charring caramelizes sugars in the wood, adding complexity to the notes of vanilla, butter, and caramel that the whiskey gradually pulls from the staves. At the same time, the barrel also removes unwanted flavors. Brand-new bourbon is full of heavy fusel alcohols and harsh-tasting impurities that are exchanged for vanillin and tannin over time. The longer a bourbon ages in the barrel, the more these flavors come to dominate, pushing aside the taste of the grain. Left to age past its prime, bourbon can become astringent and dry, woody, and one-dimensional. The gateway: Although different brands command fierce loyalties, the strict definition of bourbon means that the classic Kentucky stalwarts have more in common than differences that set them apart. 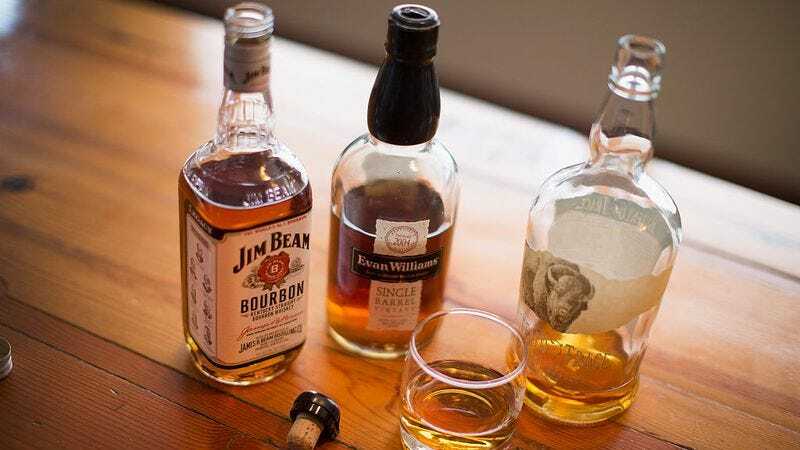 Most of the historic bourbon brands use rye as the accent grain, and brands such as Jim Beam, Wild Turkey, and Buffalo Trace provide the archetypical introduction. Each of these shows bold spiciness but is balanced with just the right amount of caramel and vanilla from spending four years (or more) aging. And importantly, each can be had for $15 to $25 a bottle. Modern brands made with rye tend to have a little less edge, making them a great bottle to reach for if you’re just beginning, but typically cost a bit more at $30 to $40 each. Knob Creek, Woodford Reserve, and Bulleit are all good choices. Other softer bourbons include wheat-accented styles like Maker’s Mark, Old Fitzgerald, or Larceny. These creamy and smooth bottles go down gentlest. The next step: So far, the brands discussed are all made by blending together dozens or hundreds of barrels to create the house style. That leads to consistency, but individual bourbon barrels are highly variable, and distilleries occasionally find standout examples that would be wasted if blended with their average juice. The resulting single-barrel bottles, therefore, represent exceptional whiskey worth trying. Buffalo Trace offers the Blanton’s and Eagle Rare lines, Heaven Hill offers vintage-dated Evan Williams; and Four Roses offers both small-batch (a few mixed barrels) and single-barrel bottlings each year. Though quite special, these bottles usually can still be found for $40 or less. New craft distillers are trying their hand at bourbon, too, but with results that are hit or miss. Universally, craft whiskey is bottled younger—there’s no time to let it age with bills to pay!—and many brands use smaller barrels, which lend stronger woody flavors (without the accompanying benefit of years of gentle oxidation and impurity removal). Some distilleries have made the process work, though. Few Spirits (Illinois) makes a classic bourbon with a rich spice smell and long finish, Balcones (Texas) experiments with 100 percent blue corn, and High West (Utah) innovates by sourcing and blending whiskey made elsewhere. Talk like an expert: The world’s top-selling bourbon is Jack Daniel’s. Take a look at the iconic square bottle, though, and you won’t find the B word anywhere on the label. Despite the liquid inside meeting every definition, the label proudly declares “Tennessee whiskey” instead. What gives? Besides the geographical distinction (Tennessee whiskey must be made in Tennessee), Jack Daniel’s defining characteristic is that the whiskey undergoes a filtration called the Lincoln County process. New-make spirit trickles through stacks of charcoal, which removes some of the natural impurities in the whiskey but also strips away some of the corn flavor. The distiller claims that the resulting whiskey is smoother, but with so many other factors affecting overall taste, that’s more marketing than fact.